← Looking back at 2012 . . . It has been a while since I have written anything of substance. I have been dealing with a great many difficult things over the past month. I felt that if I wrote during that time, that I may have had a difficult time hearing that still small voice of the Lord so I abstained from writing. During this time, a very much loved sister in the Lord challanged me to be salt but not be so salty that the food I served was inedible. I have been considering this for the entire month. It is not only good advice – it is biblical advice! With that in mind, I present the following post . . . In principle I agree with this. However, it is ALSO important to understand that archeological discoveries, while they have proved this to be true more times than not, have ALSO shown that some of the things we have accepted have been misunderstood by us as well. Fouad 266 (which is the 2nd oldest known manuscript of the Septuagint) is an example of this kind of misunderstanding that comes from accepting a theological supposition based on a lack of evidence. The Septuagint is the Greek translation of the Jewish Tanakh (Old Testament). In it, YHVH is translated as Theos (Greek for god) and Lord is translated as Kurios (Greek for lord). This initiated a supposition that had been accepted for a very long time by scholars that Yeshua (Jesus) most likely used, read, and/or said the word Theos when referencing YHVH (known as the Tetragrammaton) and Kurios when saying or referencing the Lord. However, when the Papyrus Fouad 266 from the 1st century was found in Egypt in 1939, we find the Greek text of the Septuagint for Deuteronomy with one small caveat we should be aware of: Nestled among the Greek text of this book, YHVH was NOT translated as Theos! The text of Fouad 266 is entirely Greek except for that one word. In place of Theos, we find YHVH (Tetragrammaton) in Ashuri script (Aramaic square) – In other words there is a single Hebrew word in the middle of all of those Greek words and letters! We find this same phenomenon later in Qumran as well. This is significant! It forces us to change our theological suppositions even if we have held them for a couple of thousand years. Archeological finds also let us disprove false teachers and/or teaching. For example, the Book of Abraham by Joseph Smith is a translation of his that is in The Pearl of the Great Price. It is from an Egyptian papyrus that was bought around 1835 and later purchased by the Latter-Day Saints at the urging of Smith. Joseph Smith urges his Latter-Day Saints to buy some artifacts from a Michael Chandler. Joseph convinces them to spend an enormous amount of money ($2400) because he claims that one of the papyrus is the “lost book of Abraham.” He translates the papyrus and it becomes the Book of Abraham that is listed in The Pearl of Great Price. Basically, this stone allows us sometime later to see that the Book of Abraham that Joseph Smith translated from that papyrus is really “The Hor Book of Breathings.” It is part of chapter 125 of The Book of the Dead. There is no small amount of difficulty in studying the Jewish roots of the Christian faith. The reason for this is not very easy to see without some help, some insight, some common sense, and not to put too fine a point on it, some prayer as well. Interlinears, commentaries, grammars, dictionaries, etc can lead to dead ends sometimes if you don’t know the text or if you are blindly following their translations and explanations WITHOUT using other helps, common sense, insights and prayer. I don’t expect you to believe this or understand what I am saying, so we are going pick a difficult subject that will show this and go step-by-step with pictures so that you will understand how it happens, and in some cases, continues to happen. 25 but kept her a virgin until she gave birth to a Son; and he called His name Jesus. As you can see above, the interlinear verifies what the text in the KJV and the NASB state above it. Was Mary Greek or Jewish? Was Joseph Greek or Jewish? 2 “Where is He who has been born King of the Jews? Did Herod think the “King of the Jews” would be Greek or Jewish? Did Herod’s priests and scribes think the Messiah would be Greek or Jewish? Was the genealogy of “Jesus” Greek or Jewish? Now comes some “tougher” questions. Questions that may cause you to pause. Questions that may confuse you. Questions that may even scare a few of you. Did an angel of the Lord tell Joseph to name the prophesied Messiah the Greek name Iēsous (which later became Jesus)? Uh-oh Houston, we got a problem! Several in fact. How so, you might ask? Rome persecuted the Jews. How would Joseph feel about an angel of the Lord telling him to name a Jewish child, he was to raise, by a Greek name? How would the rest of the Jewish community that Joseph and Mary were part of view the naming of a Jewish child in their community by a Greek name? The names of Jews had meanings. For example, Yosef (Joseph) means “May YHVH add.” Miryam (Mary) means “she of strong will.” What does the Greek word Iēsous mean? wouldn’t it? If not, then this verse makes no sense. That is one of the problems. Iēsous is not a translation, is is a transliteration: a letter by letter mapping from one language to another. A transliteration has no meaning at the time it is done because it didn’t exist prior to the mapping of the letters when it was done. of Hebrew origin [<H3091> (Yehowshuwa`)]; Jesus (i.e. Jehoshua), the name of our Lord and two (three) other Israelites :- Jesus. James Strong, Strong’s Talking Greek & Hebrew Dictionary, (Austin, TX: WORDsearch Corp., 2007), WORDsearch CROSS e-book, Under: “2424”. (Yehowshuwa`)]; Jesus (i.e. Jehoshua), the name of our Lord and two (three) other Israelites :- Jesus. What is “of Hebrew origin?” We know it is NOT Iēsous. Iēsous is of Greek origin, not Hebrew. Maybe we should see what the root origin means. or Yehowshu`a, yeh-ho-shoo’-ah; from <H3068> (Yehovah) and <H3467> (yasha`); Jehovah-saved; Jehoshuä (i.e. Joshua), the Jewish leader :- Jehoshua, Jehoshuah, Joshua. Compare <H1954> (Howshea`), <H3442> (Yeshuwa`). James Strong, Strong’s Talking Greek & Hebrew Dictionary, (Austin, TX: WORDsearch Corp., 2007), WORDsearch CROSS e-book, Under: “3091”. I am no going to go into the debate about Jehovah (Je Ho Va H) vs Yahweh (Ya H We H) other than to say most scholarship is in agreement that Yehovah is a MIS-transliteration of the Tetragrammaton (YHVH). However, that is for another paper at another time. 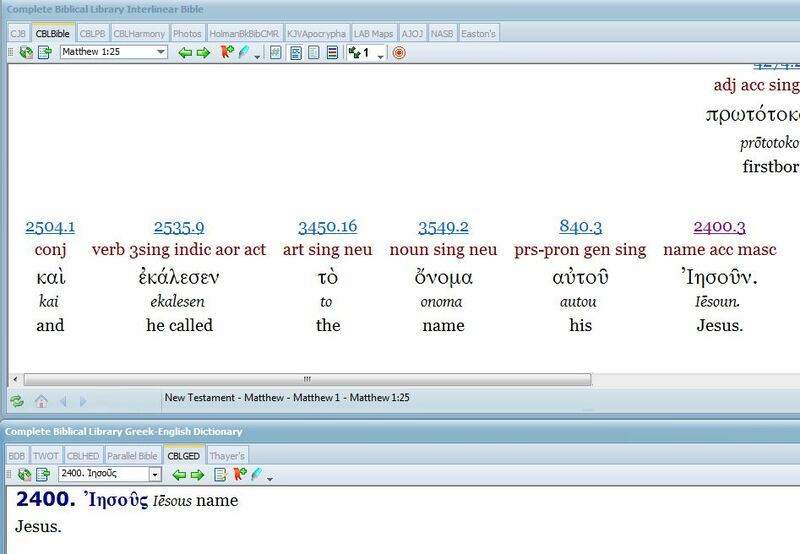 James Strong, Strong’s Talking Greek & Hebrew Dictionary, (Austin, TX: WORDsearch Corp., 2007), WORDsearch CROSS e-book, Under: “3068”. James Strong, Strong’s Talking Greek & Hebrew Dictionary, (Austin, TX: WORDsearch Corp., 2007), WORDsearch CROSS e-book, Under: “3467”. Matthew 1:21 (KJV) 21 And she shall bring forth a son, and thou shalt call his name JESUS: for he shall save his people from their sins. Acts 7:45 (CJB) 45 Later on, our fathers who had received it brought it in with Y’hoshua when they took the Land away from the nations that God drove out before them. “So it was until the days of David. Acts 7:45 (HCSB) 45 Our ancestors in turn received it and with Joshua brought it in when they dispossessed the nations that God drove out before our fathers, until the days of David. Acts 7:45 (NASB) 45 “And having received it in their turn, our fathers brought it in with Joshua upon dispossessing the nations whom God drove out before our fathers, until the time of David. Why is Iēsous translated into English as BOTH Joshua and Jesus? or Yehowshu`a, yeh-ho-shoo’-ah; from <H3068> (Yehovah) and <H3467> (yasha`); Jehovah-saved; Jehoshuä (i.e. Joshua), the Jewish leader :- Jehoshua, Jehoshuah, Joshua. Compare <H1954> (Howshea`), <H3442> (Yeshuwa`). James Strong, Strong’s Talking Greek & Hebrew Dictionary, (Austin, TX: WORDsearch Corp., 2007), WORDsearch CROSS e-book, Under: “1954”. This word has the meaning deliverer or salvation of the Lord. for <H3091> (Yehowshuwa`); he will save; Jeshua, the name of ten Israelites, also of a place in Palestine :- Jeshua. James Strong, Strong’s Talking Greek & Hebrew Dictionary, (Austin, TX: WORDsearch Corp., 2007), WORDsearch CROSS e-book, Under: “3442”. Tecnhically, yēshûaʿ is the Aramaic version of the Hebrew word yehôshuaʿ. Notice that Vine’s words has “none” as words for this. It was the same for yehôshuaʿ earlier. On the other hand, notice that the Vine’s word for Iēsous is Jesus. It is hard to ignore what is being translated in Yeshua when we see “He will save” as its meaning and then we read the 2 word for word-for-word translations above that state “he will save.” Problem is that Jesus doesn’t mean “he will save.” It is a transliteration, not a translation. The word that actually has a meaning that means“he will save” is Yeshua. a purpose: “he will save” his people from their sins. “If you have called him Jesus your whole life, did you ever while you called him that, think about his name having a definition and a purpose? More to the point, did you ever share the gospel with someone and tell them about Jesus while explaining to them that Jesus meant YHVH saves? Did you ever tell them that Jesus means that“he will save?” Did you ever tell them that his NAME is the promise AND the explanation? Maybe, just maybe, considering that an angel commanded Yosef what name the child in Miryam that was conceived by the Ruach HaKodesh (Holy Spirit) was to have, and considering that Adonai changed peoples names such as Avraham and Sara, that He did this so that we could understand the message His word was trying to convey. To be clear, I do NOT think you are a heretic if you call Yeshua by the name of Jesus. However, if you have followed this post this far, I would wonder why you would want to from here on out? Would it be because that is your tradition – what you are comfortable with? Brothers and Sisters, please don’t use this knowledge to hurt others. So often we want to share what we learn and we end up beating someone over the head with it – sometimes we even beat their brains out with it. Doing that isn’t love. Love is why we share. Love is why we study. Because we love God and because we love our neighbor. The 2 commands Yeshua said were most important. If you share it, be kind and remember to have humility. Otherwise, what is the point? In part 2 of this post, we are going to tackle a few more tough things to come to grips with. This entry was posted in Word Studies and tagged Acts 7:45, Ἰησοῦς, Christian, Fouad 266, Greek, heresy, Iēsous, Jesus, jewish, Joseph Smith, Joshua, Latter-Day Saints, Matthew 1:1, Matthew 1:21, Matthew 1:25, Matthew 22, Messianic, name, Septuagint, Tetragrammaton, the Book of Abraham, The Book of the Dead, The Hor Book of Breathings, The Pearl of the Great Price, The Rosetta Stone, tradition, yehôshuaʿ, Yeshua, YHVH, YHWH, yāshaʿ, yēshûaʿ, יְהוֹשֻׁעַ, יֵשׁוּעַ, יָשַׁע, יהוה. Bookmark the permalink.